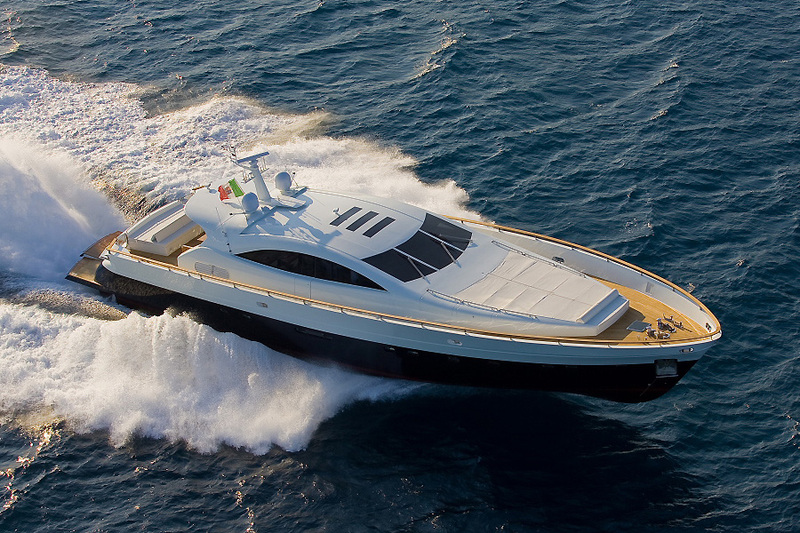 Based in Athens, Greece, the 105′ Italcraft, KAMBOS BLUE, is a gorgeous, 101′ Italcraft with a cruising speed of 28 knots and accommodations for nine guests in four beautiful staterooms and an experienced crew of five. 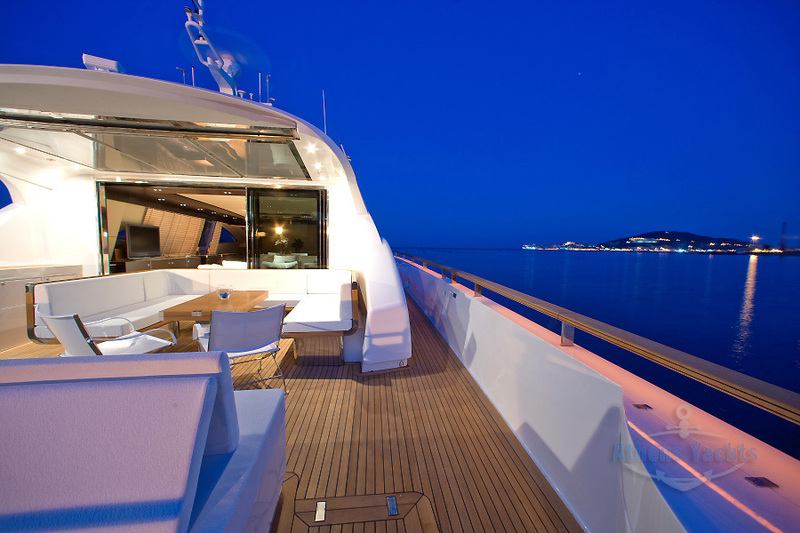 The yacht sleeps nine guests in four cabins, all located on the lower deck. 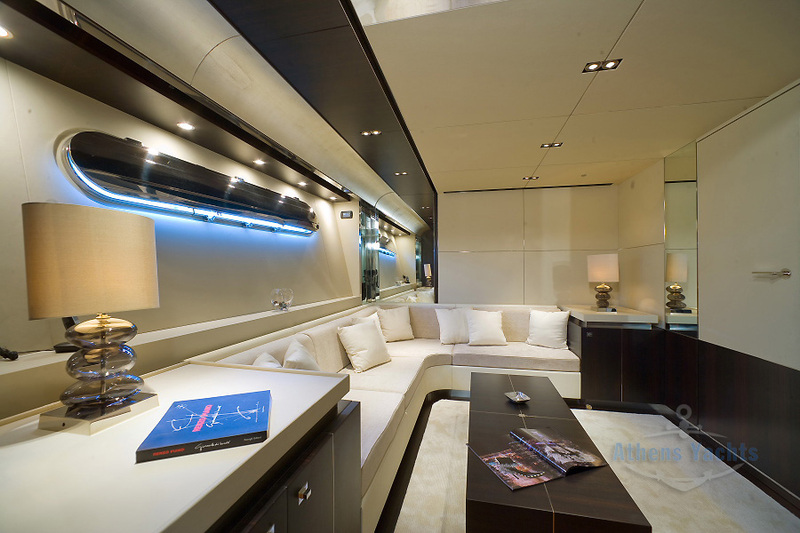 There’s a full beam master with its own saloon; a door separates the bedroom from that lounge. And what a nice cabin it is! There’s a drop down TV, lovely art, small fridge…. It’s absolutely gorgeous! 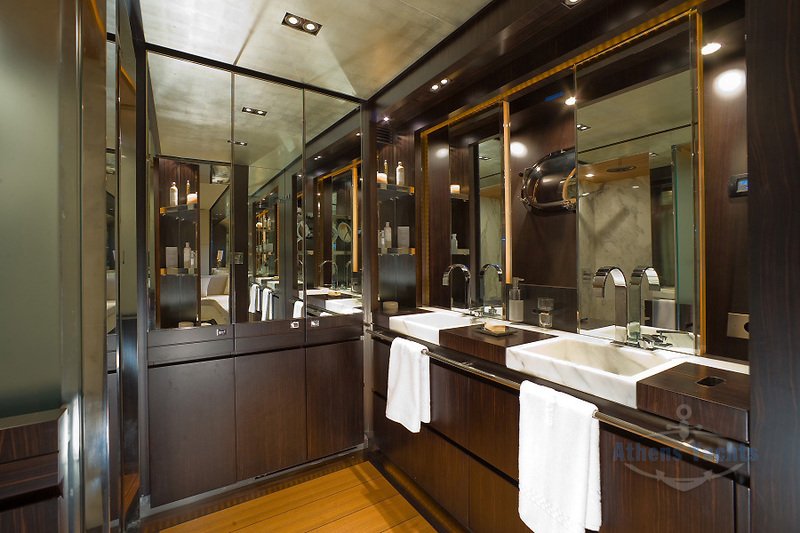 A bathroom with stone sinks and shower – nice! 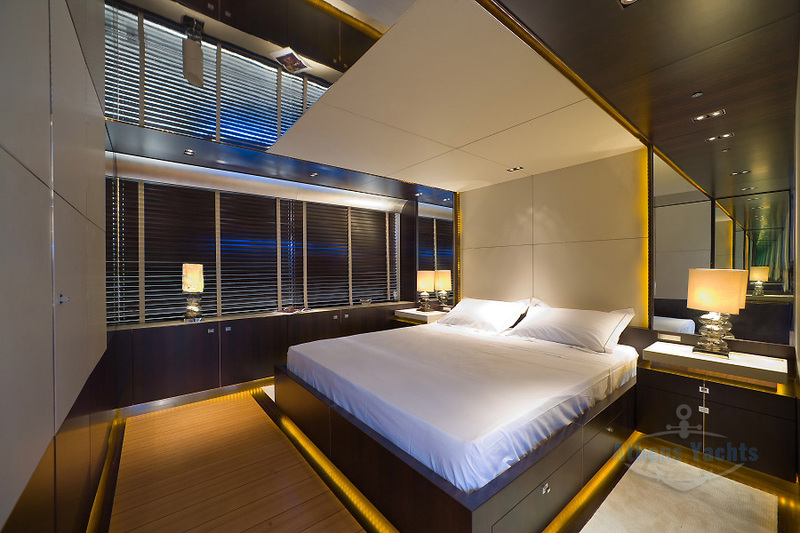 The twin cabin has starched white sheets and is gorgeous with palm floral designs…. There’s a double guest stateroom with Pullman for a child, as well as a full beam VIP cabin forward with retractable skylight overhead. The main saloon in white adjoins an aft deck in blue, separated by double doors that slide open, so that both areas become one…. The white saloon has a blue and white nautical theme with blond wood floors, triangle windows that complement the yacht’s sleek lines and top speeds…. 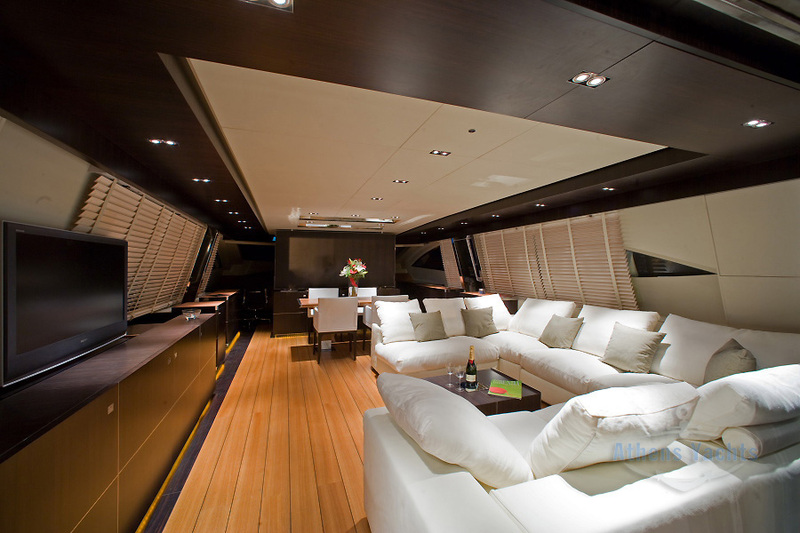 There’s a dining table forward and a dining table on the aft deck, both of which have extensions, and each table comfortably seats nine. A wall in the main saloon, featuring an art piece of a school of blue fish, separates the the bridge from the dining area…. Captain George Bailis, dressed in a blue and white uniform, is assisted by four additional crew, including a stewardess, engineer, chef, and deckhand. A team for three years, the chef has been with the yacht for nine years; the Stewardess Nicole has been aboard for four years, and all are fluent in English. Guests generally prefer to dine aboard KAMBOS BLUE, because the chef makes excellent desserts and sweets – loves to bake! Pretty Nicole loves her job; she is from Slovakia…. Being streamlined and fast, instead of a sun deck, KAMBOS BLUE offers sunbathing forward and aft on the main deck with fitted deck beds in both areas. 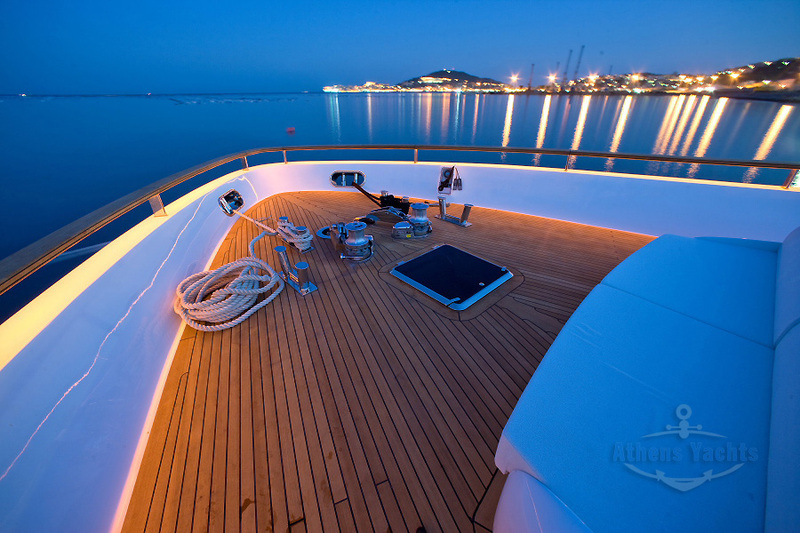 The aft deck, which is large, offers out of door dining and retractable roof with added sails…. 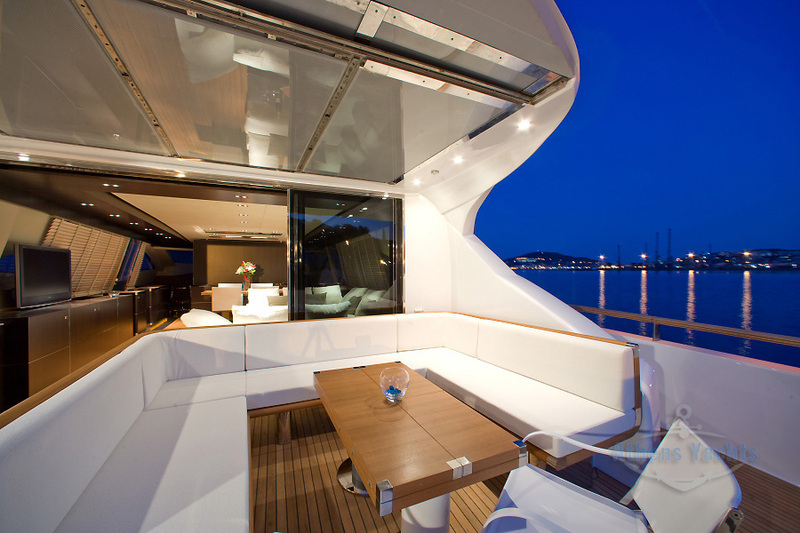 (awnings) for shade at sea. 2 Sea Bobs, kayak, kneeboard, scuba diving, a 3.20 meter tender with outboard powerful enough to pull skiers. There are waterskiis for adults and children. Please click here for further photos and a spec sheet.